The Chief of Staff to the President, Abba Kyari, on Thursday met some labour leaders at the Presidential Villa, Abuja, to resolve the issues that led to the ongoing warning strike by workers. Labour unions, had on Wednesday directed workers to go on strike over the failure of the Federal Government to reconvene the tripartite committee on the new minimum wage. The workers are demanding N50,000 minimum wage. Currently, N18,000 is the minimum wage in the country. Kyari said on Thursday that he called the meeting to ascertain what stalled the negotiation on minimum wage. The National President of the Nigeria Labour Congress, Ayuba Wabba, who led the delegation, said the outcome of the meeting would be taken to the relevant organs of the union. He said, “The Chief of Staff tried to give us detail of government’s position which we will convey to our members; then we can revert to him. On when the strike will be suspended, he said, “The strike, as you are aware, was called by a larger organ. We must get their mandate before we can make any pronouncement on the strike. We are here on representative capacity, even as leaders. Kyari had, at the brief meeting, assured the labour leaders comprising executives of the NLC, Trade Union Congress, and the United Labour Congress that talks on the minimum wage would be reopened. The level of compliance with the nationwide strike ordered on Thursday by the organised labour differed across the country. While in many states, the strike paralysed federal and state secretariats as civil servants complied with the labour leaders’ directive, some banks and other businesses attended to customers. In the Federal Capital Territory, financial institutions and other private business premises shunned the directive of the congress. The Central Bank of Nigeria, Securities Exchange Commission, Deposit Money Banks and insurance companies failed to comply with the directive. Our correspondents, who went round the Abuja city, observed that the banking halls were opened for customers. Some of the banks visited are Union Bank of Nigeria Plc, Access Bank Plc, Guarantee Trust Bank Plc, Fidelity Bank Plc, Zenith Bank Plc and United Bank for Africa Plc. Others are First City Monument Bank Plc, First Bank Plc, EcoBank, Diamond Bank and Unity Bank Plc. Some of the bank officials, who spoke to one of our correspondents on condition of anonymity, said they had yet to get any directive to comply with the strike. One of the bank officials said since there was no signal from the National Union of Banks, Insurance and Financial Institutions Employees, bank workers could not comply with the strike directive. But the strike paralysed activities in all the offices at the federal secretariat in Abuja. Our correspondents, who observed activities at the secretariat located in the Three Arms Zone, reported that most workers did not report for work. A few of the workers who reported for work were seen sitting idle at the gates of the complexes in the secretariat. Security was also beefed up at the gates to forestall a breakdown of law and order. At the complex housing the Ministry of Foreign Affairs, the flag of the Nigeria Labour Congress was hoisted on the main gate which was closed to workers. The big car park located behind the Eagles Square used by workers was virtually empty. Those who sell N100 ticket for those who park their cars inside the car park were, however, on duty. The industrial action also affected petty traders who were usually patronised by the workers. Most hit were food vendors who have their shops inside the car park. When one of our reporters visited the shops, only a handful of them were operational. Those who operated only offered skeletal services. Military and para-military officials were, however, seen taking part in the rehearsal for the Independence Day parade at the Eagle Square. In Ondo State, there was total compliance by workers as government offices, banks, public schools, hospitals and many public organisations were shut. Bank customers were disappointed as banks were shut. Some of them, who spoke with The PUNCH, said they were not aware that banks would join the strike. A trader, who identified himself as Ike, said he went to a branch of a commercial bank in Akure to deposit a huge sum of money but was turned back by security personnel, who informed him that the workers were on strike. Many residents were seen at Automated Teller Machines to withdraw money. It was also gathered that the development was the same at government institutions in Ondo town, Ikare-Akoko, Owo, Okitipupa and other parts of the state. The Ondo State Chairman of the Trade Union Congress, Soladoye Ekundayo, and the Chairman of the Joint Negotiating Council, Abel Oloniyo, led other labour leaders to move round public offices to ensure compliance. The TUC Chairman in the state, Soladoye Ekundayo, commended workers in the state for complying with the directive of the unions, noting that public institutions and offices would remain closed until government yield to the demands of workers. Activities in government institutions in Kwara State were also paralysed as workers complied with the strike directive. One of our correspondents, who monitored the compliance level in Ilorin, the Kwara State capital, observed that offices of government ministries, department and agencies, as well as courts were locked. Labour unions used vehicles to block the entrance to the complex housing the office of the state Head of Service. It was also observed that many schools and financial institutions were locked. However, in Benue State, there was partial compliance as the state and federal secretariat, as well as some commercial banks were opened as of the time our Benue State correspondent went round the capital city. However, public schools were shut, forcing students who had gone to school to return home. It was gathered that the ministries and the banks were later forced to close down when labour officials invaded their offices. 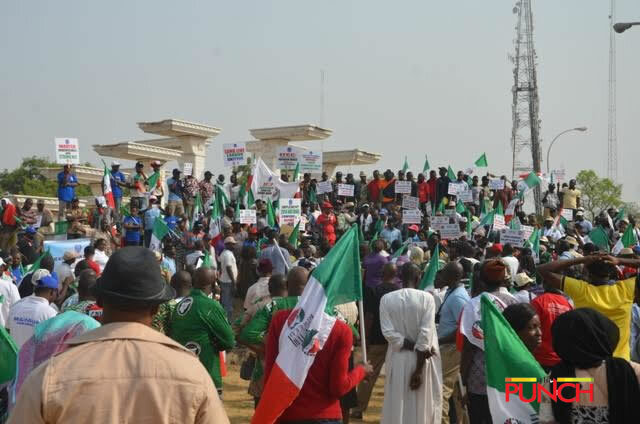 The state Chairman of NLC, Comrade Godwin Anya, maintained that the level of compliance by state workers was encouraging and expressed the hope that it would continue the same way on Friday (today). Banks, public schools and governmrnt offices in Ogun State observed the warning strike. Pupils who turned up at both primary and secondary schools in Sango-Ota, Abeokuta and Ifo, among other areas, were turned back as many teachers failed to show up. Also, banks in Abeokuta shut their gates against customers. At Oke Ilewo, Abeokuta, where many of the banks are located, customers were seen in front of the banks. Also, First Bank located at Sapon, Abeokuta, shut its gate. A few civil servants who showed up at Oke Mosan secretariat in the capital city were seen talking in small groups in front of their office blocks. Many of them returned to their homes before noon. The state Chairman, NLC, Akeem Ambali, said the strike had commenced and it was being obeyed in the state. The warning strike recorded total compliance in Delta State as public and private establishments obeyed the directive of labour leaders. One of our correspondents, who monitored the strike in Asaba, Warri, Effurun and other major cities across the state observed that banks, schools and government offices were shut. In Asaba, the state capital, all ministries, public schools and other government offices were under lock and key. The federal secretariat housing ministries, departments and agencies on Okpannam Road was padlocked when The PUNCH visited the area around 11.45pm on Thursday. However, the strike recorded partial compliance at the Federal Medical Centre, Asaba, as some workers were seen at their duty posts. In Warri, Sapele, Effurun and Ughelli, our correspondent gathered that local government councils, school and government agencies were shut. Some of the banks which had earlier opened for business activities were forced to shut down when NLC officials stormed their premises. The Delta State Chairman of NLC, Mr Jonathan Jemiriyiegbe, told one of our correspondents that the strike was fully complied with. Commercial activities were partially paralysed in Bauchi State. Some NLC leaders in Bauchi State went round all establishments, particularly government offices, to ensure compliance with the directive. Labour leaders also forced workers who had turned up for work to go back home. At the Abubakar Umar state secretariat and the federal secretariat, officials of the NLC were seen at the gates turning back civil servants who came to work. However, when The PUNCH visited the Abubakar Tafawa Balewa University Teaching Hospital Bauchi, normal activities were going on unhindered. The industrial action did not have any significant effect in Enugu on Thursday. Our correspondent observed that commercial and official activities went on as usual. Commercial banks opened for business, while public and private schools also went about their normal activities. Many motorists had rushed to filling stations in a wave of ‘panic buying’ on Wednesday over fears that the strike could lead to scarcity of petrol. However, the filling stations opened for business on Thursday and the queues which appeared the previous evening disappeared. Most workers turned up for work at the Enugu State secretariat. The situation was a bit different at the federal secretariat, where our correspondent observed a low turnout of workers. The strike recorded total compliance in Umuahia, the capital of Abia State. One of our correspondents, who monitored the exercise reported that around 9am, pupils of public primary and secondary schools in the state were seen leaving their school premises. When our correspondent visited the federal and state secretariats at Ogurube layout in Umuahia, the complexes were shut. There was total shutdown of government and court activities in Kogi State as the judiciary and the state workers complied with labour’s call for a warning strike. Our correspondent noted that the high court complex and the state secretariat observed that the secretariat was shut as no civil servant was seen in any office. Also, no court was in session, just as no worker was seen on the premises. The Information Officer of the Kogi State Chief Judge, Sakeeb Seid, said no court sat because of the strike. Similar visit to the state customary courts showed that there was total compliance with the strike. The industrial court in the state did not sit as the entrance was under lock. However, some banks opened to customers. In Lagos State, early morning invasion of the state secretariat in Alausa by labour leaders forced civil servants to join the strike. It was gathered that the unions locked all the gates into the secretariat and left the only one to the Deputy Governor’s office around 5am on Thursday. The same treatment was also given to other government offices in the state, forcing workers to return home. Magistrate courts in Ikeja, Ogba and Ikorodu were deserted when one of our correspondents visited. Activities were also paralysed at the Lagos State High Court in Ikeja and Igbosere as the gates were locked. Also, at the Lagos division of the Federal High Court in Ikoyi, judicial activities were grounded as the administrative officials of the court stayed away. At the Nigerian Stock Exchange, normal trading activities, however, continued on the floor without any hindrance. The Vice President, NLC, Amechi Asugwuni, said, “We are very happy with the level of compliance in Lagos State today. We shut all government agencies. The prospect of a quick resolution of the ongoing strike by organised labour may not materialise as the NLC said it had no plan to hold a meeting with its organs on the issue. NLC General Secretary, Peter Ozo-Eson told one of our correspondents on the telephone on Thursday that labour unions had yet to choose a date to brief their organs and take a decision on the strike. In the same vein, the Medical and Health Workers Union of Nigeria has directed its members to join the strike. MHWUN President, Mr Biobelemoye Josiah, at a news conference on Thursday, said the directive became necessary as the union was an organ of the NLC. Meanwhile, the Federal Government said the Wednesday meeting with organised labour on the minimum wage did not end in a deadlock. The Minister of Labour and Employment, Chris Ngige, described the parley as a success, despite the declaration of a nationwide strike by the labour leaders.